Workers drill holes at a demolished old neighborhood slated for new residential construction in Shanghai, China on 11 February, 2009. 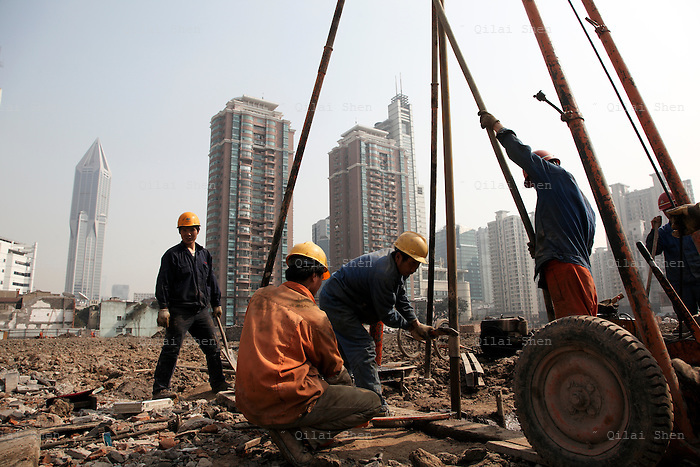 Workers operate a drill on an empty lot, once an old residential neighborhood, in Shanghai, China on 11 February, 2009. Large swaths of land in Shanghai has been cleared for new development in recent years, moving former residents out of the center of the city and driving up real estate prices in the process. For the past decade, Shanghai has underwent the largest reconstruction in recorded history, over 20 million square meters of land, approximately a third of Manhattan, were developed between year 200 and 2005 alone.